I’ve been on the road a lot recently and so I’ve become more familiar with the contents I zip up for my travels. I’ve been in New York, Paris (travel content coming very soon) and making frequent trips to London, so I want to give you a rundown of what goes in my wash bag and travel case. You’ll notice that, like most of the products that come with me, I appreciate its design as well as use. Le Labo is a perfect example of this. I visited their Williamsburg store and café last month and luckily got talking to the team. A couple weeks later I had a delivery from them containing some new releases. I’m normally against a 2-in-1, but if the hotel bathroom lets me down, it’s always good to have something on standby. 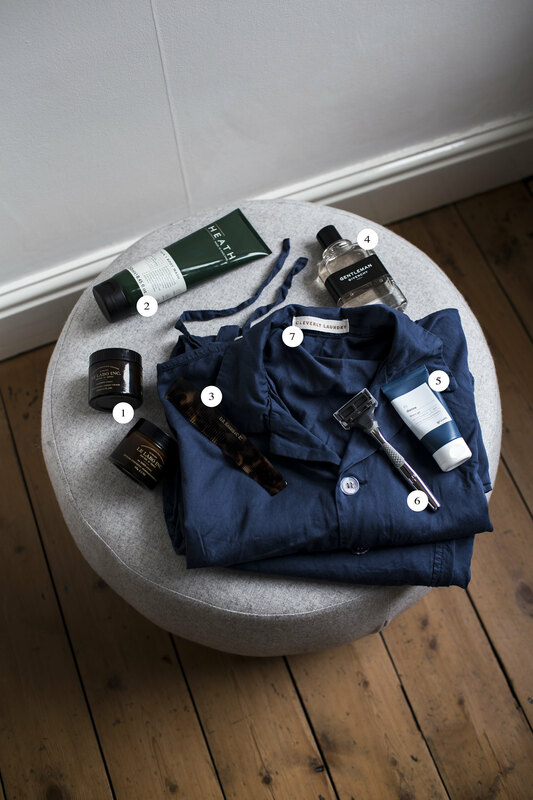 Favouring natural ingredients, Heath is a new grooming brand that I’ve been testing out lately that’s packed full of good things for the skin. I included this comb in my last My Stuff, but this is always in my wash bag. It’s much slimmer than a brush so it’s both a space saver and a good-looking tortoise shell appliance. Dr Harris & Co also gets a plus point for its logo. When it comes to fragrances, I don’t think I can say with confidence what my favourite is yet. Luckily I have a few in rotation with the current travel choice being Gentleman by Givenchy. I’m keen to learn more about the whole top notes, body and base notes jargon. This one was kindly given to me by Mat, acting almost as a Grüum advocate. A small tube of shave gel was exactly what I needed on the road. Grüum call it the “robin to your razor” and I have to say it’s working a treat so far. The Batman to this shaving duo, is my Harry’s razor. Now available in the UK, I honestly think Harry’s is one of sleekest razors around. Traditional shaving brands tend to have that unwanted dad feel to them, whereas Harry’s feels youthful and speaks to my level and age.